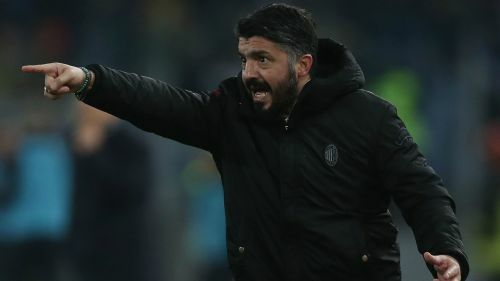 AC Milan head coach Gennaro Gattuso insists that his side will not take Serie A's bottom club Chievo lightly on Saturday. The Rossoneri travel to Stadio Marc'Antonio Bentegodi firm favourites to make it seven wins from nine league games as the race for a Champions League qualification place hots up. That superb recent run has moved Gattuso's side one point ahead of their city rivals Inter in third and gives them a four-point advantage over Roma in fifth. The Milan boss, however, does not anticipate his side having it all their own way against their hosts. Domenico Di Carlo's side are 12 points away from safety, but have held Lazio and Inter to draws at home this season, and Gattuso is expecting a challenging game. "The game against Chievo will be tough," he told a media conference. "We have to be very careful tomorrow and battle until the end. They respect their opponents and we have to be on guard. Caldara makes the 23-man squad for #ChievoMilan: Welcome back, Mattia! "We have to be aware that we are playing against a team that has it all to play for. Chievo will be at their best against us. "It is not by chance that Lazio, Roma, Juventus and Inter all struggled against them." Spanish forward Suso has now failed to score since January 21 after another frustrating outing in last weekend's slender 1-0 win over Sassuolo. Gattuso, though, has backed the 25-year-old to rediscover the form that saw him linked with Real Madrid earlier in the season. "He is not struggling physically," he explained. "I have seen few players partake in 50-60 games a year in top form. It is normal to have some bad performances. He is an important player and is vital to us making the next big step forward."